Jay Cutler at Qualcomm Stadium on November 9, 2015 in San Diego, California. 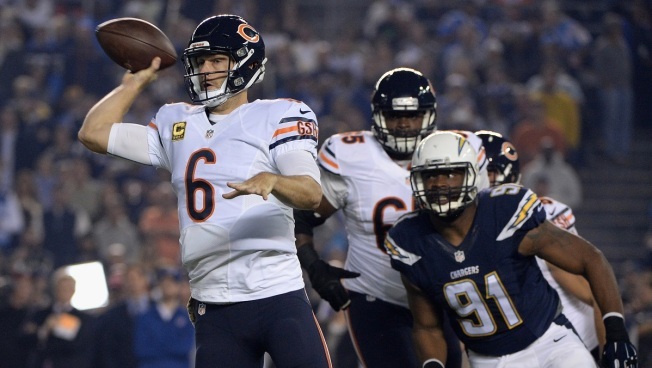 The Chicago Bears are trying to beat the San Diego Chargers on Monday night, but quarterback Jay Cutler has already made history in the primetime tilt. When Cutler completed a one-yard touchdown pass to Martellus Bennett in the second quarter, it marked the 138th touchdown toss that he's thrown since joining the Bears in 2009. That number eclipses the total of the great Sid Luckman, giving Cutler the team's all-time record for touchdown passes. Luckman's record had stood since the 1950 season, when he threw his final touchdown after a 12-year career with the organization.